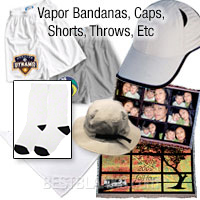 Vapor Apparel: Vapor® SubliSock™ Starter Kit - Adult Size. 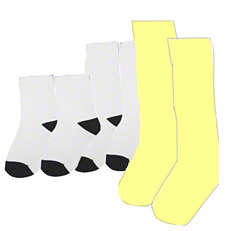 TIPS on printing SubliSocks - The best way to decorate SubliScoks is by pressing the sock “side-to-side.” The “Hockey Style” insert (in the shape of an “L”), was engineered for this method of decorating. However, we also discovered from market feedback that some decorators, especially those catering to athletic teams, decorate socks in a front/back method. To accommodate this style of printing, we developed the “Straight” insert. In either case, we still highly recommend “rolling” the edges after pressing one side, and before pressing the other. This allows for the print to slightly overlap thereby eliminating press lines or white gaps. 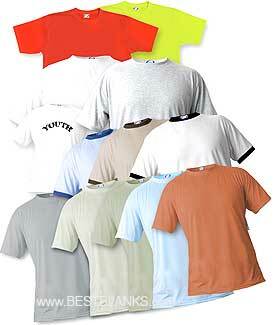 This sample pack offers a good variety of popular shirts and is ideal for creating samples for your showroom. 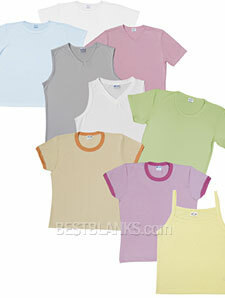 Delivers look and feel of organic cotton with wickability of advanced poly-performance fibers. Includes the American BackCountry Collection, an innovative line of sublimation-friendly colors. Great for: Basketball, track and field, marathons, surf and beachwear, industrial environments. 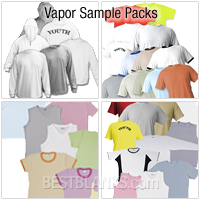 Please note that occasionally sizes must be substituted to fulfill sample packs. Features: wicking factor, sublimation-friendly colors, two needle double-stitch seams, four thread over-lock for extra strength in hem seams. Color and/or size combinations may change without notice. Light and durable, the material is anti-bacterial and mildew resistant. 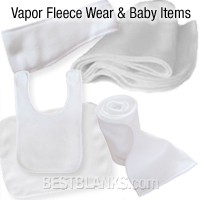 Great For: Athletic team warm-up, attire for booster clubs & organizations, cheerleading, Pilates & yoga. 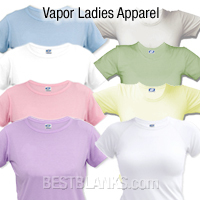 Lady Classic White (XL), Blue Sky (Med), Pink/Punch Ringer (XS), Natural/Apricot Ringer (SM), BabyDoll Keylime (Med), BabyDoll Firefly (SM), Micro Sleeveless Mercury Silver (LG), Tank Firefly (XS). 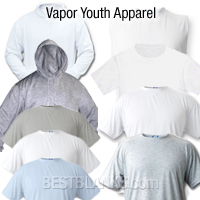 Vapor Apparel: Cold Weather Sample Pack - 10oz (hoodie, sweatshirt, & zipper hoodie), 6.9oz (brighter white long sleeve), 5.9oz (ash heather long sleeve). 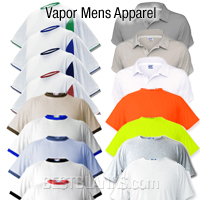 High performance wicking garments with the look and feel of cotton that is odor, bacteria, and mildew resistant. Great for: Athletic team warm-up, attire for booster clubs & organizations, skateboarding, surf, coaching staffs, & athletic retail shops. 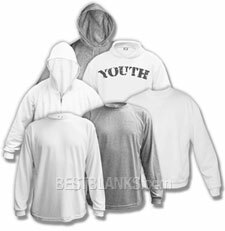 Six long sleeve garments for those cold temperatures including a brighter white zipper hoodie, an ash heather hoodie, brighter white youth hoodie, brighter white sweatshirt, brighter white basic-t long sleeve, & an ash heather basic-t long sleeve.